Isn’t it great when we follow the mystery genre? I’ve been saying this as long as I can remember. I’ve been mentioning this over and over – the unlikeness of the culprit being the servants in Umineko. From personal theories to other general reasoning. Granted, it was “within the realm” of possibilities for a servant to turn out to be the culprit. They aren’t included in Knox’s 10 or the original commandments that any of the servants couldn’t possibly be culprit of a story, however, I always assume they weren’t for many reasons. the culprit was a “servant” or “the help”. There was *one* where a subordinate was *involved* in the murder affair but wasn’t directly the killer of the story. For the other example, the “help” was indeed the *culprit*, but the premise of the mystery was not of murder thus there as we can see it was permissible seeing it wasn’t of great importance. To put it in perspective I refer to , a petty, weak crime (I’ll call it that) such a robbery or deceiving can’t compare to murder when we measure one against the other one in a detective novel. .S.S. Van Dine’s 20 makes a great emphasis that in a mystery anything but murder wouldn’t be considered a real mystery, therefore the culprit must be a character and this person must be responsible for the death of someone. Such cliche of a servant such as the butler, or in general who is the *most suspicious* of the story in these cases is always the servant since they are the closest to the person who was murdered is unacceptable as the solution due to both clicheness and be symbol of a poorly written mystery. Do we want that? Of course, we wouldn’t because there must be a more satisfactory answer to our questions. I don’t know about others but I didn’t consider the servants to the *real* culprits of the story. My theories , unless in special cases, didn’t include the servants as being the culprits of being the killers of the story, therefore this is matches perfectly with my reasoning. 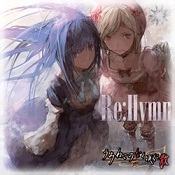 This entry was posted in General overview and tagged chiru, EP 7, mystery genre, Requiem, Ryukishi07, S.S. Van Dine, umineko, Umineko no naku koro ni, Willard Huntington Wright. Bookmark the permalink. I was wondering…..if a servant solves the epitaph…..does that mean they got elevated from the status of a servant to the head of the family? 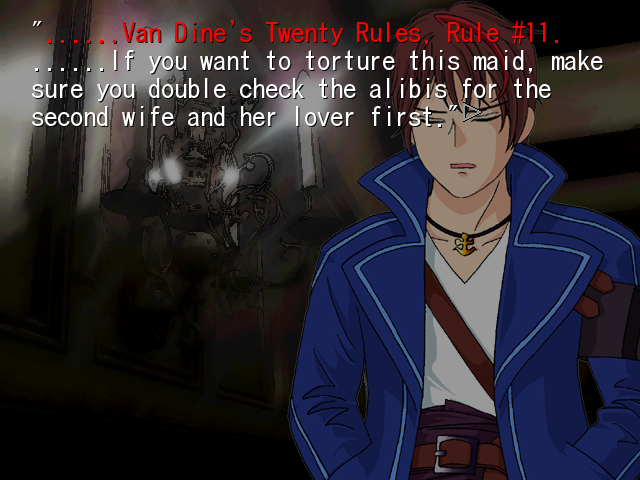 (this kinda dodges the Van Dine Rule) So technically that mean that particular servant could still be the culprit. Normally a servant wouldn’t stop being a servant because it’s a “fact” that they are servants and their status shouldn’t change throughout the story we’re read. Why? Because they were first introduced as servants. In addition, it’s unlikely any the furniture could solve it as it’s been mentioned that they couldn’t crack it no matter how much they tried. On the other hand, Kumasawa or Genji may know where it is for a fact so they wouldn’t need solving it. Of course, let’s not forget that one doesn’t necessarily need to “solve” the epitaph to find the gold – knowing the location would be enough. Now, what would happen if they “weren’t servants but friends or acquaintances in an episode? That’ll put them right in the suspects list for the culprit since they wouldn’t be portrayed as servants but regular characters. But we won’t be seeing that scenario any time soon. Compared to the not-so-serious loophole I made in Van Dine #11, having a servant solved the epitaph and becoming head might stand a better chance at bypassing the rule in a fairer way. We’ll have to trust R07 in not pulling something like because it’d be almost the same as Battler being the culprit for EP5 because of a play on words. We know neither Natsuhi nor Battler were the culprits on that one but it was “theoretically possible”, still not the “real truth” of the mystery. I’m not convinced that Van Dine’s #11 is that simple. I note that Dlanor explained in the Episode 5 ????? section that “Knox’s 3rd. It is forbidden for secret passages to exist.” doesn’t actually deny the possibility of secret passages. It denies the possibility of “secret passages that cannot be found by the detective” – if the detective searches a closed room for secret passages, either the detective finds evidence of a secret passage or there is no secret passage. This is evidence that the literal reading of the rules of Knox and Van Dine aren’t necessarily the full rule. The original Van Dine’s #11 talks about how the culprit must be “a worthwhile person”, and that it is this which Van Dine believed made servants as a culprit unsatisfactory. I would suggest that the mystery stories his rules were written for didn’t generally concern themselves with the motives and backgrounds of the servants, which was what made them not worthwhile. This is evidence that the intended focus of Van Dine’s #11 is different than the shorthand version. Combining these two points, I would propose that Van Dine’s #11 has a meaning closer to “servants who are only shown acting as servants may not be the culprit”, and that it merely fills the place of a more specific Knox’s 8th, that evidence of the servant’s guilt must be presented in the story. I note as well that this fits the instance shown in the beginning of Episode 7, where Will defends the servant girl, who had no motive presented during her story. isn’t “worthwhile” by the original rules. It also mentions it’s far too easy as one of the arguments -those found it to make sense by that interpretation. Shannon and Kanon has massive involvements in the story. They’re worthwhile to the point that they even got an EP to their own (along with the cousins) and they stray from the point of “just servants” by rebelling/furniture status/connection to the story/etc. This point you’ve proven that by a different interpretation – this is also plausible. My question would be based on this claim – What about Genji? Would Genji count as “only” a “servant” therefore is impossible for him the culprit? Unlike Shannon and Kanon he has very little story of his own as far as I know and he basically fills the role of the main butler/servant of the victim in a story. -edit- Reading WH 2nd patch atm – there’s a bit of a story to Genji. I honestly find it hard to believe that Van Dines rules would apply to the games 1-6 or 1-4. After all, there is rule 12, which forbids the additional culprits to the murders. The final murder of the 1st game (Natsuhis death) heavily implies that the culprit that killed Natsuhi was killed by Natsuhi, creating “an additional culprit to a murder”. It has been proclaimed in red that all survivors have alibis in the murder of Natsuhi, so the culprit had to be someone who did not survive. Same problem occurs in the murder of Nanjo in the third game. Who killed the one who killed Nanjo? This question creates additional culprits. Suicides and accidents are forbidden (Van dine rule #18). Unless these rules are changed or denied during the course of the series (Which might hurt the purpose of the rules; to avoid easy solutions), this creates a contradiction in to the games, which can only be avoided, if the rules won’t have effect to those games. When Will was putting Clair to sleep at the end of Episode 7, he had to answer all the twilights throughout the first four games. His answers were all vague, but generally started with either “Illusions to illusions” or “Earth to earth”. The likely explanation for this is that those he starts with “Illusions to illusions” are either fake closed rooms or fake murders, while those he starts with “Earth to earth” are real murders. In the third game, he answers the first twilight with “Illusions to illusions” (probably because it’s a fake closed room with the second door in the boiler room which can’t be locked at all), and the second through eighth with “Earth to earth”, indicating that Rosa, Maria, Rudolf, Kyrie, Hideyoshi, Natsuhi and Krauss actually were killed by someone at the time they were originally found. George, however, wasn’t part of a twilight, so he could be Nanjo’s murderer in the way you mentioned. As for motive, the likely one to me seems to be that George thought (rightly or wrongly) that Nanjo was the murderer. MiF, the first game doesn’t imply at all that Natsuhi killed anyone in her duel (and if she had it would have been a victim defending themselves and not an additional culprit). They find her lying on the ground with a smoking gun, but there is no other body. 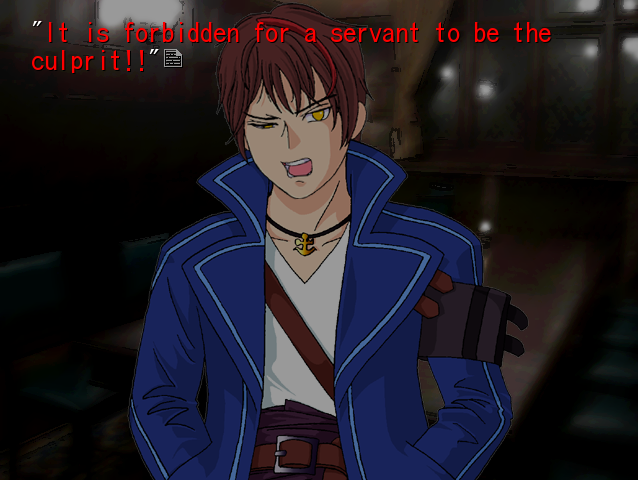 The game then ends as Battler raises his gun to someone walking down the stairs in front of them. Amazing theory on the illusion to illusion and earth to earth thing…I hadn’t thought of that. Illusions to illusions in the second twilight of the first game, making reference to the illusion that the chain created in the closed room. Said closed room resembles TOO much Battler’s closed room in episode 6. It impossible for a servant to be the culprit. Why else would they even mention it if it didn’t? It’s a mystery story. If confusing the issue of the identity of the culprit isn’t enough reason to mention it, the fact that it seems like something the climax of the story could hinge on would be. If “Knox’s 3rd. It is forbidden for secret passages to exist.” doesn’t fully deny the possibility of secret passages, I see no reason why Van Dine’s 11th fully denies the possibility of a servant as the culprit rather than just denying the possibility of servants with means and opportunity to carry out the murder but no motive being the culprit. Will used Van Dine’s 11th to save the servant girl because the Inquisitors weren’t bothered about her motive. I don’t think it could be used to prove the innocence of Shkannon who apparently has split personalities which were romantically involved with three different Ushiromiyas, is secretly the child of Kinzo and his secret lover/daughter, secretly the real family head, and secretly wants revenge for being thrown off a cliff by Natsuhi as a baby. Seriously, can you imagine any sensible way of applying “servants cannot be the culprit” in full for Shkannon? She was specifically shown planning the murders and how to make them look like closed rooms from a mystery story, her motives are given in detail, she has in her posession a collection of guns and the stakes, and she has the gold to ensure the loyalty of several people who will provide her with alibis. You’d dismiss all that rather than interpret Van Dine’s 11th a little more loosely?